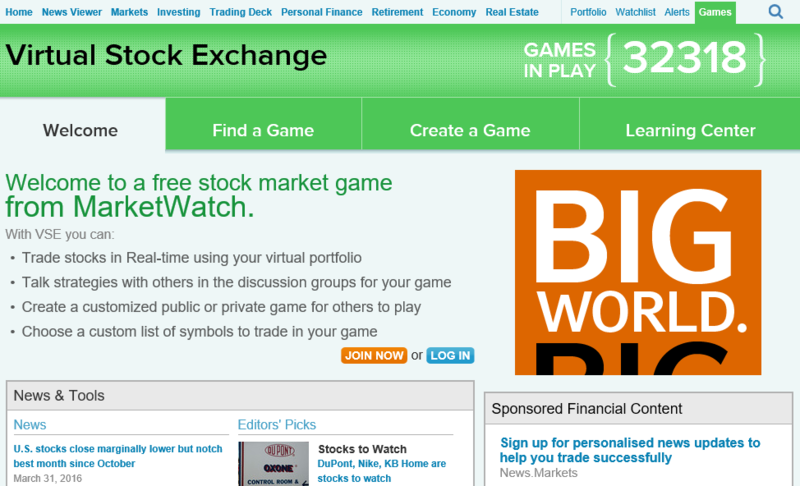 Marketwatch does not have much polish - it looks like they set it up about 10 years ago and basically left it running. They are big, based on their contest counter they might be the biggest stock market game around, but I think that has more to do with inertia than anything else. Everything I see shows that Marketwatch puts all their emphasis on the news and content - the stock market game even blasts back to an "older" version of their site when you click on it. This is basically an older-generation stock game that has not done a great job keeping up with the times. MarketWatch focuses a lot on their articles and news. However, their stock game is left on one side. Visually, it is very disorganized, full of ads and sponsored information. Most teachers looking for a class stock game would have some difficulties since there is no guide or tutorial that will direct them through it. Creating your own game is an extensive process. On the other hand, you are able to see your rank in an easy way and some useful information regarding your portfolio. Their free stock market game definitely needs some improvements. Still, it is a great site to be informed about the latest financial news and to read interesting articles regarding business news and analysis. 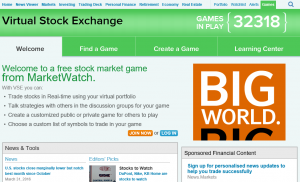 MaketWatch is a site that offers a free stock market game. 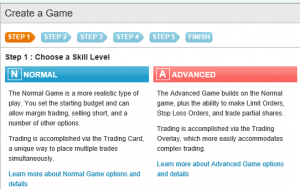 They claim that with their virtual stock exchange you can trade stocks in real-time using your virtual portfolio, talk strategies with others in the discussion groups for your game, create a customized public or private game for others to play and choose a custom list of symbols to trade in your game. The biggest problem I see with Marketwatch is that I see a LOT of players in public contests with really high returns - over 200% in some cases. I've also seen a few reports from elsewhere that they aren't very good at posting their splits and dividends - I did receive mine in my test accounts - but finding a way to get a hold of the support team was an exercise in futility. This website has way too many ads; there is not much information about the services they offer or how to use it. 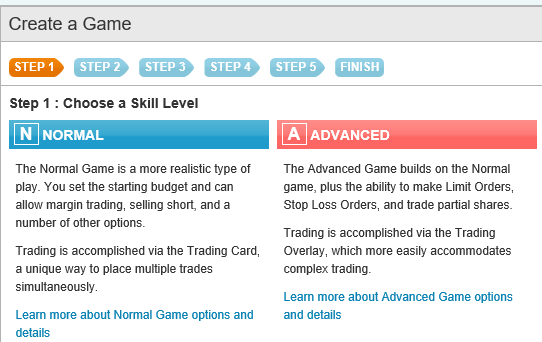 To start playing on their stock market game you have to create an account first. Personally, I found this process a little long. First, you have to fill out your personal information, and then you will have to wait a few minutes until you get a confirmation email. After receiving your confirmation email you will need to verify your email address, subsequently you are offered a bunch of exclusive offers and finally you are welcomed to their site. The site does not offer any guides or tutorials to help you get started. After you figure things out, you are shown a number of companies, in the news today, so you can have some ideas on what stocks to trade. Besides that you are pretty much on your own. 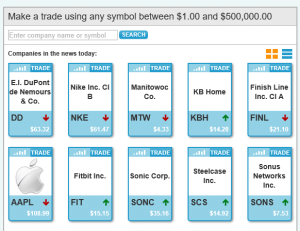 The information given on each stock is not very complete. When you are reviewing your portfolio you don’t have any charts, financials or analysis. In addition, information is not shown or available right away. They have discussion groups for your game, but most of the people involved are just asking question of how things work. MarketWatch allows you to create your own contest; it can be normal or advanced. The difference is the ability to make limit orders, stop loss orders, and trade partial shares. 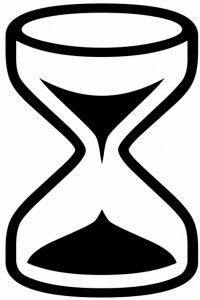 However creating a game is also a long process. To create a game you will have to follow 5 steps before starting to play. Also, you have to take into account that even though you created the contest you are not automatically added to it. You can also join contests other people have created, this process is very easy. Contests are filtered by difficulty level and access. Also you can see the number of players, time created and the start date and the end date. This way it is easy to find a game. 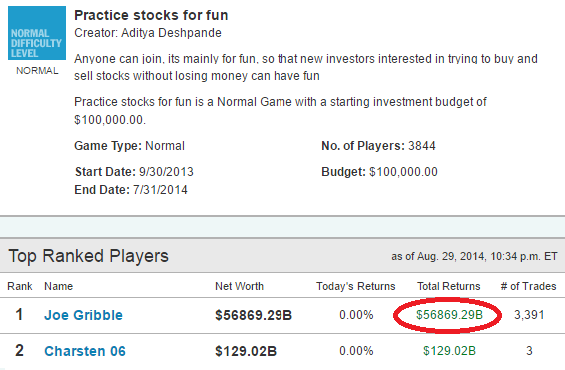 These kinds of games are a fun way to learn and improve investment strategies. However, with this stock game, many students might realize they can just 'cheat' to win. In a contest, while many people sweat out their returns, others find ways of cheating obtaining ridiculously high returns, making MarketWatch games unfair to compete. For instance, in this picture you can see a game that started with 100k and the top person has 56 trillion, you know that site is broken if it shows that type of return in a year. So I decided to stop trusting MarketWatch games. I feel that MarketWatch is a great website for market news and events. You can find numerous articles that have a unique style to them and that are very easy to grasp. 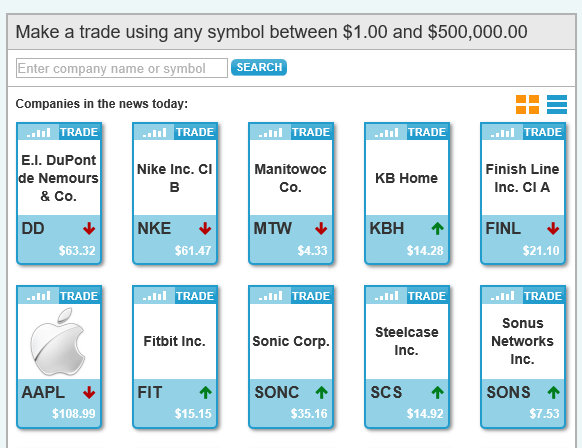 Marketwatch has a variety of information regarding the fundamentals and technicals of a stock. Unfortunately their stock game is not as good as their articles.